The first thing to notice is the use of the word: place, rather than the Creating a Classroom Where Thinking is Valued. 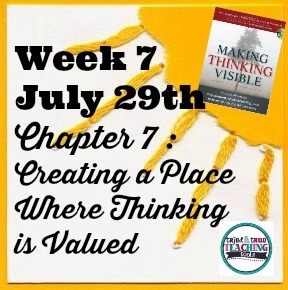 Creating a place where thinking is valued means a classroom, a school, a small group; anywhere & everywhere where thinking is valued! And thinking does not mean solely the individual thought process of a student. As creativity expert Sir Ken Robinson (2010) says, "Most great learning happens in groups . Collaboration is the stuff of growth." I also love the authors' point: "Rather than say, 'We value thinking here,' leaders of any group need to articulate the kinds of thinking that they value. Only then can efforts be employed to make that thinking visible." (p. 220) So as teachers, we need to decide what kind of thinking we value, then be sure to make this evident to our students. Teacher Lisa Verkerk schedules a dedicated 45 minutes per week for reflection. Her students use sketchbooks and a variety of colored pencils, watercolors, crayons, pastels, and collage materials to create visual metaphors that represent what understanding of a given topic or question means to them. Verkerk says it is natural for students to be very literal in their expressions at first, but teaching about metaphors (one thing could stand for something else), helped her students become more free to use abstract colors, textures, lines, and shapes, to represent their thoughts and ideas. Julie Landvogt, a teacher in Australia, participates in a Breakfast Group, a professional book club with other teachers. Landvogt's thinking about this group: "My intention was that this group would function as a think tank, a critical friends network, and a forum for an open and tentative trying out of ideas." The main idea is that in order for schools to be places of thinking for children, they must also be places of thinking for adults. I love this!! Many years ago, I used to facilitate a monthly professional book club. We would meet after school (snacks provided!) and share how the reading applied to our own classrooms. Now it is easy to join a multitude of book studies online at Facebook. But I do still love the face to face contact and conversations, too! By focusing on a big, generative idea during a field trip to the Museum of Modern Art, teacher Dara Cohen sets the stage for learning. She asked her middle school students to focus on only one thing: identity and how artists communicate ideas about identity. Selecting this one focus aspect helped Cohen guide her students through the museum, as well as made for an elaborated conversation. She selected only a few exhibits to view, since she knows thinking takes time and she wanted her students to look closely at the selected pieces of art before discussing. She used the same questions modeled chapters 4-6: "What makes you say that? Can you explain?" Time: good thinking requires time! Everyone needs time for insights, connections, and understandings. Routines: and of course, incorporating thinking routines into a daily part of our classroom! Which of these forces that shape culture do you make time for?